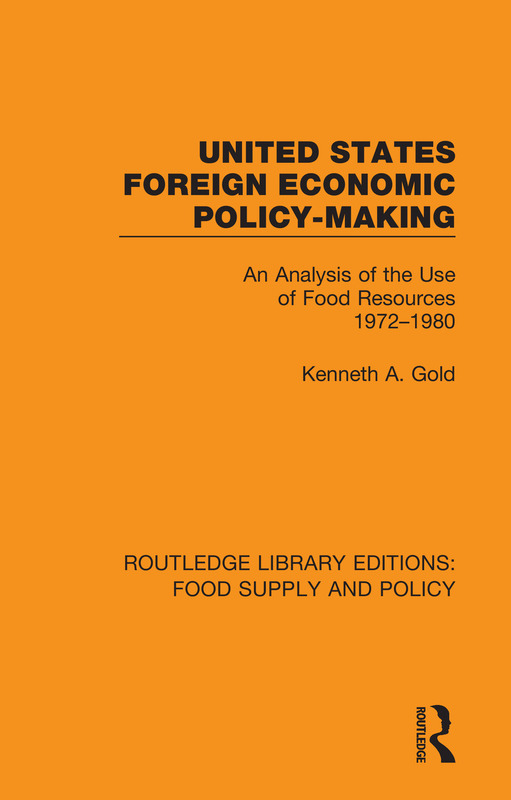 This book develops an analytical framework for understanding United States foreign agricultural policy through a "state interest" approach, and describes and analyses seven cases of food policy decisions through this perspective which shows that decision makers sought on most occasions to utilise US food resources to accomplish foreign policy objectives. A fundamental aspect of the statist approach is the recognition that those sectors representing the interest of the state will inevitably confront other actors in the policy process who are likely pursuing conflicting objectives. This book looks at contemporary circumstances in the formulation of US agricultural policy, in particular those alterations that occurred beginning in 1972. It offers an analysis of the nature of foreign economic policy and outlines the re-emergence of economics as an important component of US foreign policy, and an analysis of the concept of "food power". Reissuing works originally published between 1952 and 1999, this set provides a wide spread of scholarship on issues surrounding food provision throughout the world. The earlier books look at import and export changes during times when previous trade routes and options changed while later ones mostly consider food assistance policies, poverty and famine, and welfare. These books cover third world studies, economics, anthropology, politics, environment, agriculture and population studies as well as food and nutrition.